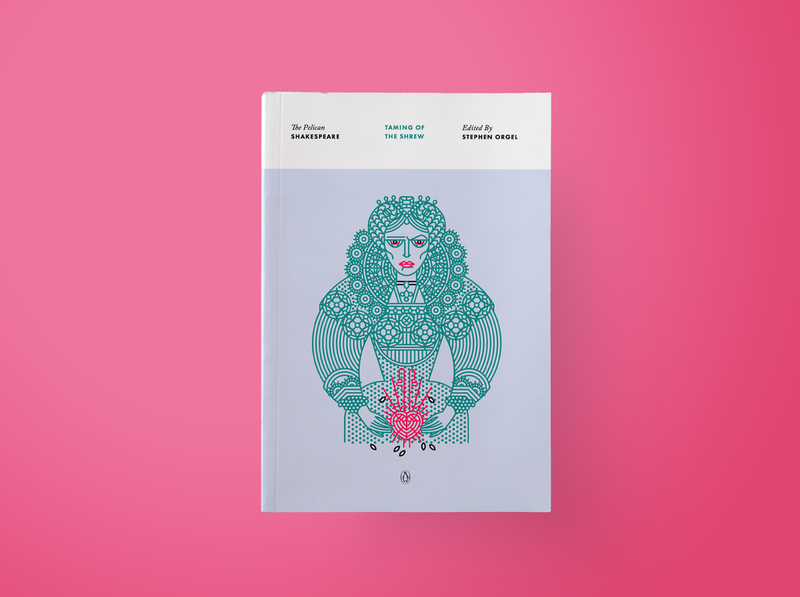 Repackaging for the Pelican Shakespeare series, the authoritative resource since 1956, coinciding with the Bard’s 400th death anniversary this year. A total of 40 books, the series is ongoing and art directed by Paul Buckley. We used a modern linear and geometric style to approach these classics in a contemporary manner, categorized as Tragedies (black,) Comedies (light blue) and Histories (maroon.) The series won a Gold Medal at the SOI Annual Exhibition (Book category.) Thanks to Paul Buckley and Elda Rotor for taking a chance on me. Foul tempered Catherine (front) has an aversion to men (strategically placed dried flowers.) On the back is her little foil and sister, Bianca, who is charming and looking for love (strategically placed lushness.) The figure on the back can also be interpreted as Catherine after she’s had a change of heart.